Spring break is the perfect time for letting your hair down and leaving the stresses of college life behind you. However, that doesn’t mean you should throw caution to the wind. The following tips will help you have fun and stay safe during spring break. Spring break is always more fun with friends. Before you let your hair down, pledge to look out for your buddies. Always travel in groups of two or more. Arrive together and leave together. While a fling might sound fun, going home with strangers is risky. You don’t need to be joined at the hip, but you should know where your friends are at all times. Pay attention to the hotties they talk to and how much they’re drinking. If you think they’re being unsafe, step in to protect them. You might even take turns avoiding the booze so someone always has a clear head. Stay alert and aware of your surroundings and situations. That doesn’t mean you can’t relax and have fun, but you should recognize if anything feels off or amiss. Your gut instinct is a valuable gauge of how safe you really are. Listen to any uneasy feelings and act on them before you get into trouble. Party in well-lit, busy places rather than darker ones with fewer people. When you’re using cabs and ride-sharing services, use the GPS to make sure your driver takes the route you’d expect. Double-check the license plate and driver photo match up when you’re using ride-sharing providers. This extra vigilance can help you avoid a sticky situation. Studies suggest more than 2.2 million of the 6.31 million full-time college and university students enrolled in the United States will have their drinks spiked. Drink spiking can affect men too. Simply watching your drinks can dramatically reduce your risk of becoming a victim. Stay alert from the moment your drink is made. Choose sealed cans or bottles at parties rather than drinks from a punch bowl. At bars, get the drink yourself and watch the bartender make it. Keep an eye on your drink until it’s finished. Leaving it to go to the bathroom or even turning your back on it while you chat could give someone the opportunity they need. 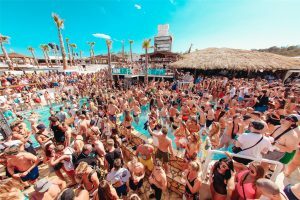 Few things spoil a spring break like losing valuable items. Some simple tricks can keep them safe though. Don’t pack very valuable items like high-end jewelry or bags. They can make you a target for thieves, so why take the risk? Store any essential valuables in your hotel safe before going out. Keep credit cards in an RFID wallet so crims can’t scan them and steal the details. Bra pouches and money belts worn underneath clothes are ideal for storing cash, identification, and hotel keys securely. Spring break can be dangerous if you don’t exercise caution. That doesn’t mean giving up on fun though. With these tips in mind, you’ll have a blast and stay safe on your spring break.